day gig: Full time mixed martial artist. 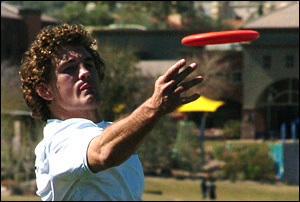 When disc golfers hear the name Ben Askren, they often think, "I know that name." But not necessarily for golf. Askren is a collegiate wrestling legend, having earned two NCAA Division I wrestling titles with Missouri before joining the US Olympic wrestling team. In 2008 he traveled with Team USA to the Beijing Olympics, where he won his first match but lost the 2nd to the eventual bronze medallist from Cuba. A purple belt in Brazilian Jiu-Jitsu, Askren made his pro mixed martial arts fighting debut in 2009 by defeating his opponent via TKO early in the first round. In 2010 Askren became the Bellator MMA World Welterweight Champion by defeating Lyman Good in the 5th round by unanimous decision. 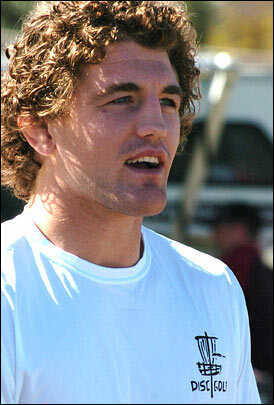 Going into the 2011 MMA season, Askren had grown his competitive record to 7-0. His current MMA stats are here. Oh yeah, chances are good he'll whomp you at disc golf too. Askren throws his Force for exceptional distance. (174 gm) I love how overstable the Force is. (174 gm) It goes so far! I am just figuring out how to start this on a hyzer flip it then have it come back for lots of extra glide. (174 gm) Very overstable with a little less distance then the Force. (174 gm) Very easy for me to get this to flip over and fly right. (174 gm) A great choice for long straight drives. (175) My favorite disc of all time, like so many other players. It does what you tell it to do. (174) Has become my best putter, I like the slight overstability is flies with.